The word ‘Sublime’ is a pretty awesome word. Take a moment and say the word outloud. Sublime. Ahh. Don’t you just feel awesome now that you said it? 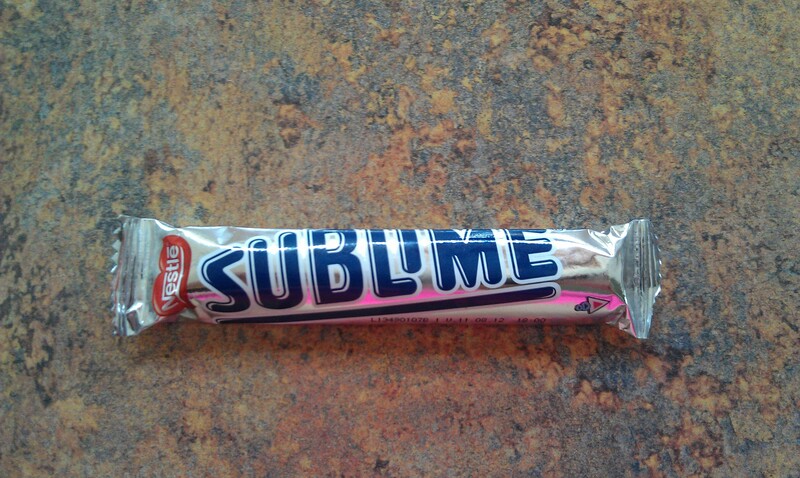 Aside from the fact that Sublime is one of my all time favorite musical groups, it is also the name of a candy bar. A candy bar that was unknown to me until a mere week ago. Could this really be? A candy bar worthy of the name Sublime? While the bar may have been quite small, it was indeed Simply Sublime. After getting a nice run in, I met Mommy back at the gym in our neighborhood. The gym is pretty small and is located within the clubhouse. Also located there, is a refrigerator. From time to time, people will leave food in the refrigerator after a party and, of course, I always take a look to see what is available. On this day, I found a silver package with that amazing word, ‘Sublime’ written on the front of it. Totally curious, I removed it from the refrigerator to have a better look. Right away, I knew this bar was from a different country. It had the Nestle logo on it and on the back, stated ‘Chocolate con leche.’ After further review, I found it to be from Bolivia. The size of this was indeed pretty small. I guess I am so used to the King Size varieties sold in the US, that small candy bars seem obscenely small to me. I debated if I wanted to try it right then or wait until later in the day. In the end, I simply could not wait. I opened the gorgeous silver packaging (it was indeed really pretty) and found one bar with four segments. Each segment was stamped with that lovely word ‘Sublime’ and was the same size. I saw right away that the bar also contained some peanuts. I wonder why this was not included in the ‘Chocolate con leche’ label on the outside? Ohh well…I didn’t care…it was time to eat. I broke off a piece and placed it in my mouth. Since this came right out of the refrigerator, I decided to chew right in rather than let it melt into my mouth. I found this chocolate to be the most un-sugared piece of chocolate I have ever had. It wasn’t sweet…like not at all. And you know what, it was really good. The flavor was so basic which allowed the cocoa itself to be the key component rather than the sugar. This cocoa mixed with the extra-crunchy peanut, resulted in a satisfying piece of chocolate. I continued to eat the Sublime pieces and found every single one to be just as good. 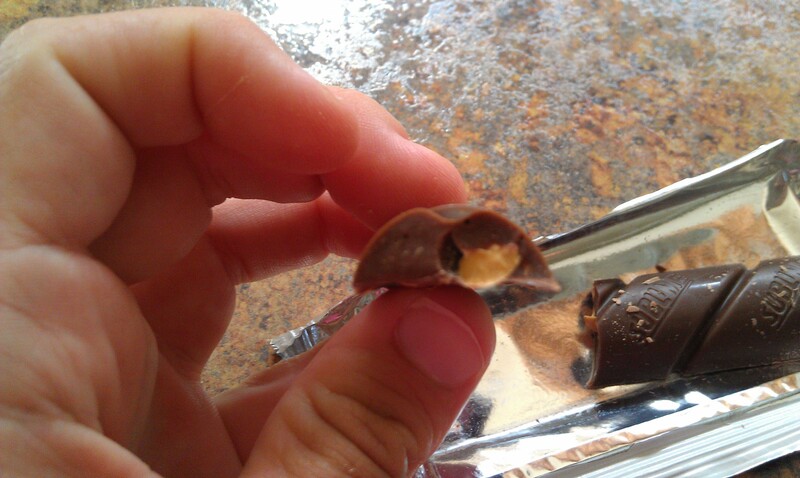 The same non-sugary chocolate continued as did the extra-crunchy peanuts. Even though this candy bar was small, it was the perfect size for me. I never eat a normal sized candy bar at one time so this, just hit the spot. And the fact that it was so not sugary, made it great. 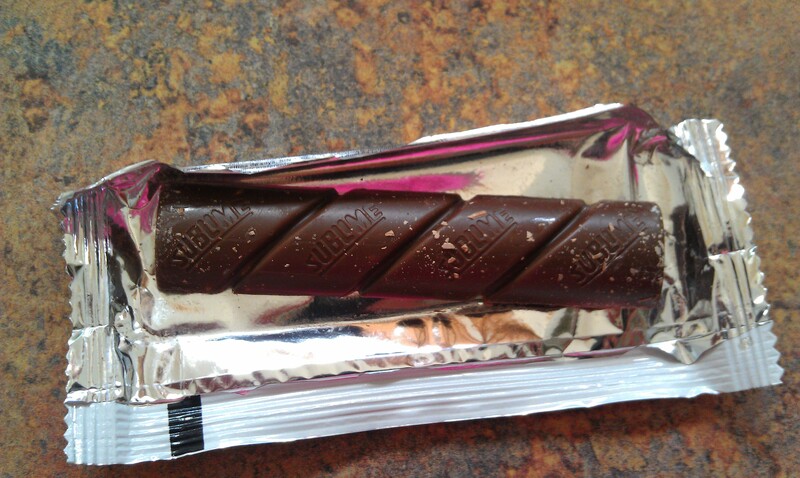 After I finished this bar, I debated grabbing another from the refrigerator to take home. In the end, I did not and regret it. I have checked in the Ethnic Food isle at the grocery and have yet to find this bar. But, trust me, once I find it, I will be purchasing another. If this super silver package crosses your view, give it a try. The natural cocoa mixed with crunchy peanuts, can only be described one way – Simply Sublime.